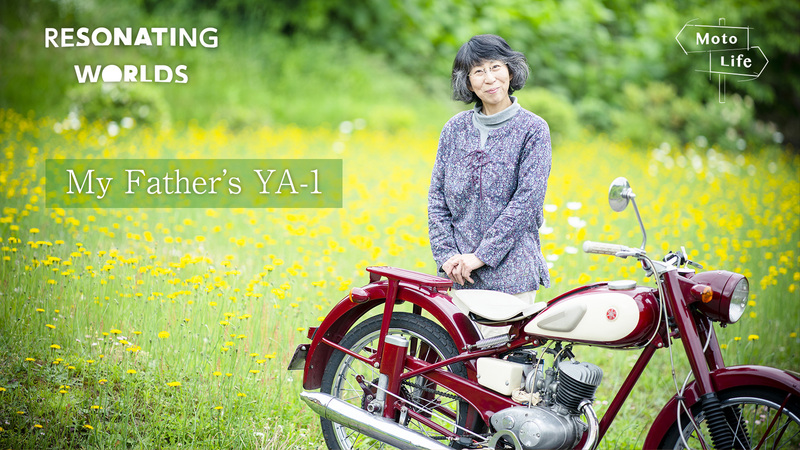 My Father’s YA-1 - Moto Life | Yamaha Motor Co., Ltd. The bike my father left that I have now until the end of my life. 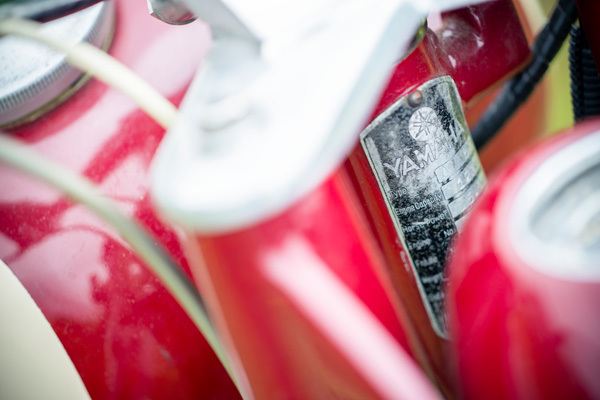 A story of parent, child and a Yamaha motorcycle. 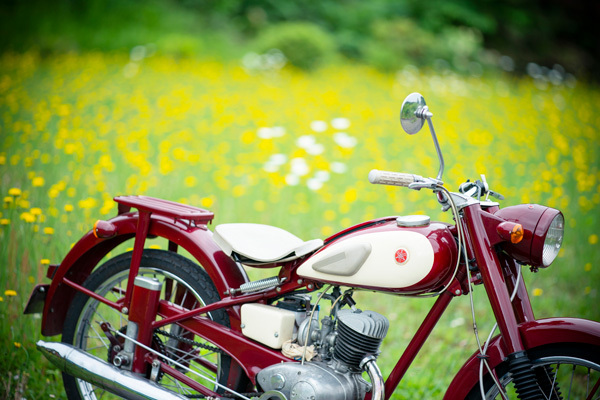 It was in April this year that the 55 mph editorial department was contacted by Satoe Tomita from Hokuto in Hokkaido with a request for us to come and see the bike that her father had left behind three years ago when he passed away. It was easy for us to imagine that this was not a run-of-the-mill motorcycle if she was making a point to contact us about it from such a far distance. I soon headed for Hokkaido. I turned off the state highway heading north from Hakodate, and after not more than 5 minutes down a narrow farm road, a small warehouse came into sight. There was no sign of life and nothing but empty fields stretching out as far as the eye could see. All I could hear was the clear sound of the bird song. I was noticeably startled when the woman I had come to see, Satoe suddenly opened the door in front of me. 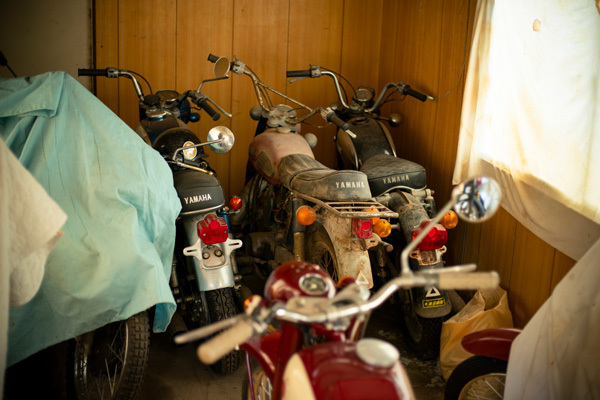 Inside there were a number of machines from the 50s and 60s, the dawn of the Japanese motorbike industry. Some bikes were from manufactures that were only around for a short time, their existence having been long washed away in the tides of time. 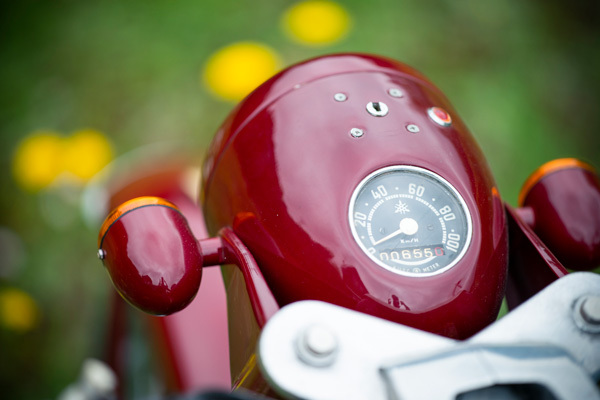 Satoe then gently placed her hand on a slim, brilliant madder red colored machine in the middle of them. 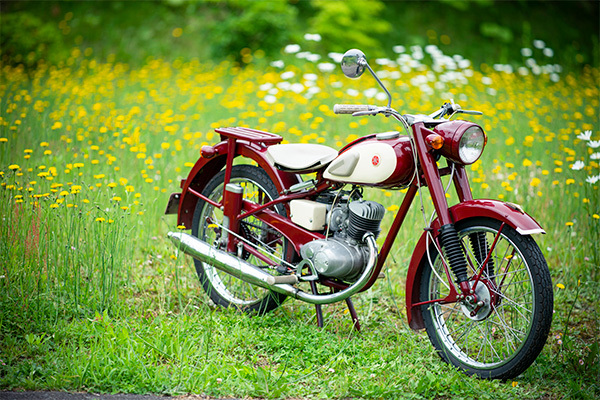 The “red dragonfly”, although covered in a thin layer of dust was in such splendid condition that I couldn’t believe that I was looking at a bike over 60 years old. Satoe’s father, Eiji had apparently restored the machine back to life himself. I could see just by glancing at it his extraordinary passion for motorcycles. Satoe then began to tell me her father’s story. 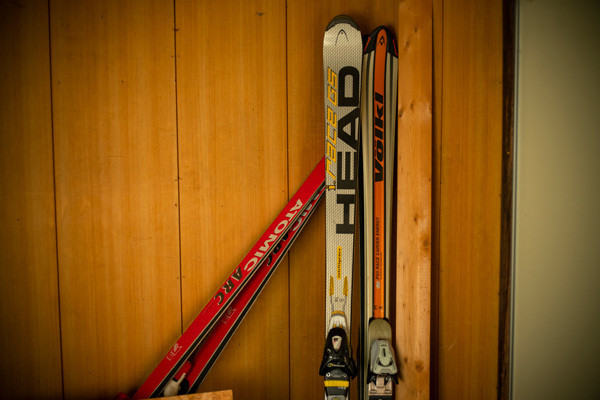 The owner of the YA-1, Eiji Tomita was born in 1945 in Nakafurano in Hokkaido. The second son of eight brothers, he apparently loved motorbikes and automobiles from a young age. When he used to see something being driven down the road, he and some other children would excitedly chase after. Motorbikes and cars of that time weren’t very fast, and the roads were also unpaved so if it was only for a short distance the children were actually able to keep up with the driver. To them these machines were iron snakes like creatures, and the smell of gasoline that emanated from them was also unfamiliar and that gave them even more of an otherworldliness. For children from such rural areas where horses were still used for transportation, these cars and bikes were practically UFOs. From the age of 20, Eji started at a vocational school studying automobile maintenance. As he was the second son, he wasn’t in line to take over the family farm, so it seemed like a natural path for him to follow his passion for automobiles and become a mechanic. At that time, because there was a nationwide shortage of mechanics, after only a year and a half of training he could graduate and was in the fortunate position of being able to start employment anywhere in the country he wanted. After graduation, he got a job as a mechanic at a car dealers in Hakodate. Although he was working on cars every day, in private, he would often admit that his real passion laid more in vintage motorcycles. And finally, after his daughter Satoe had grown up and left home, he started to do restoration work on bikes in his free time. He turned part of his house into a two-story garage and made it his workshop. It had the atmosphere of an old bicycle shop with tools hanging from all the walls and the constant thick smell of oil in the air. He had a big collection of machine tools like lathes, and any parts that he couldn’t get hold of he just put together himself. 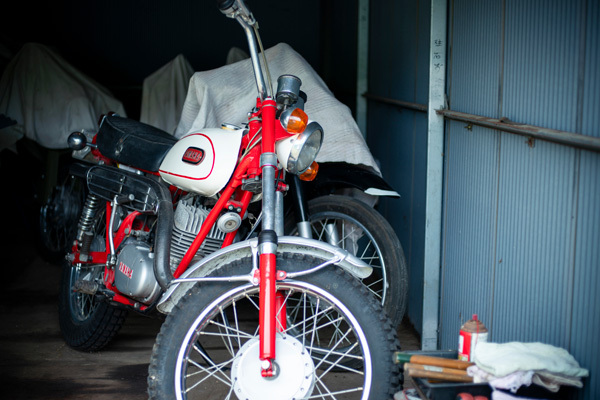 He completed his first full restoration of a vintage bike in his early forties. 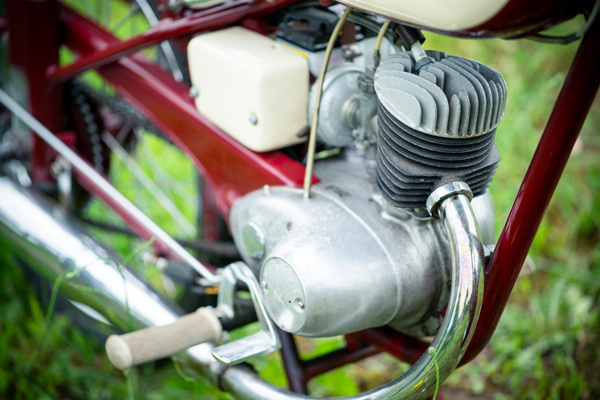 It was a prewar Rikuo motorcycle with a hand shift gear clutch, manual oil pump and manual ignition mechanism. 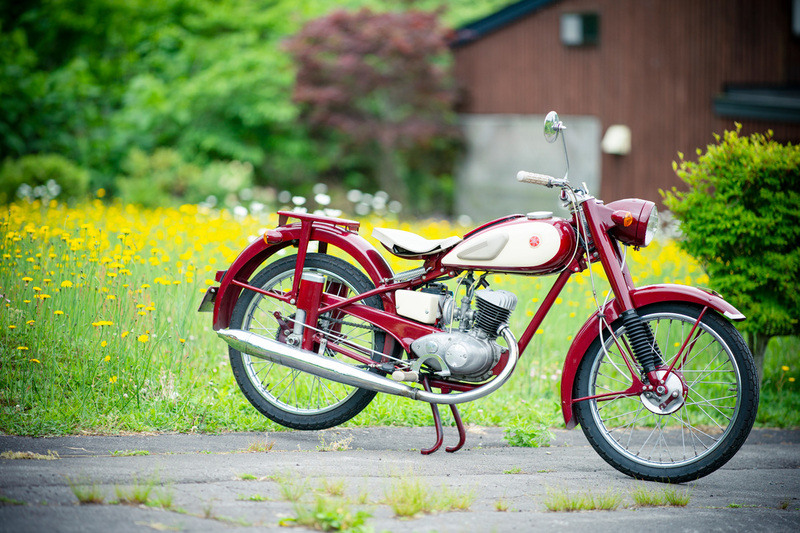 This was the first bike that Eiji had bought after graduating vocational school. He bought it second hand, but until this time it had been dismantled and left in storage until he finally brought it back to life. 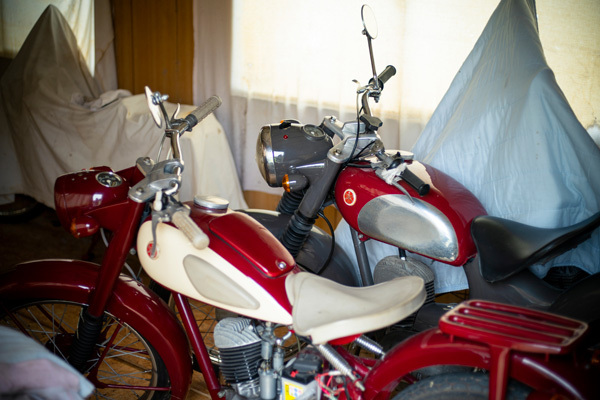 Following the completion of the Rikuo, Eiji worked on restoring more classic bikes one after another. Friends and acquaintances heard about Eiji’s restorations and brought him old bikes that they didn’t know what to do with. 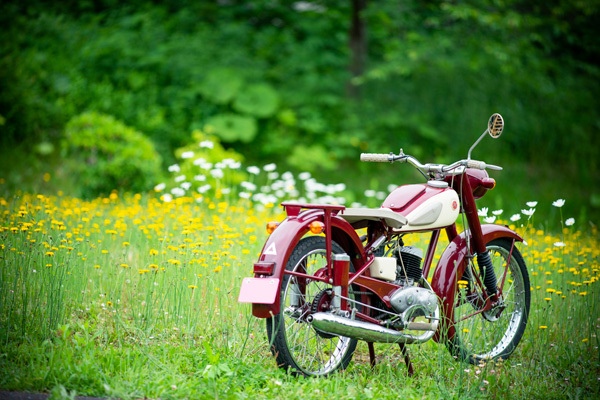 It became very rare for him to spend any of his own money on bikes, instead he was fully resorting bikes that were handed over to him in a condition so poor that most people would think was just a pile of scrap iron. 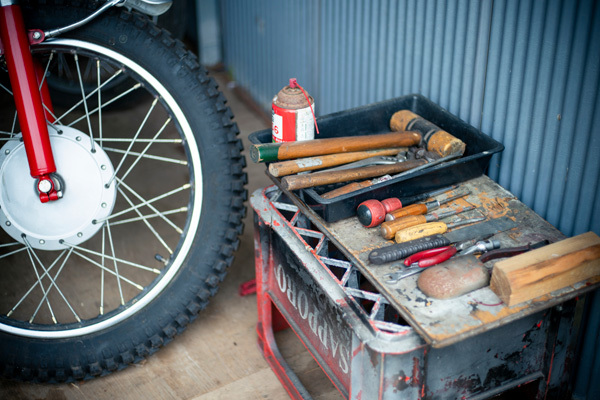 The bikes kept coming and he continued to restore them for over 40 years until literally just before he passed away. The work process of the restorations steadily became more and more accomplished, each time making improvements to the tools and the way he was using them. Eiji particularly disliked “redoing” work and said that he had a policy of achieving what he wanted first time. Of course, sometimes things didn’t go as planned, but overcoming these difficulties added to the enjoyment of doing up the bikes. Over the course of dissembling and rebuilding the machines, stepping up to the challenge to show his increasing love and respect for the original makers seemed to make him incredibly happy. 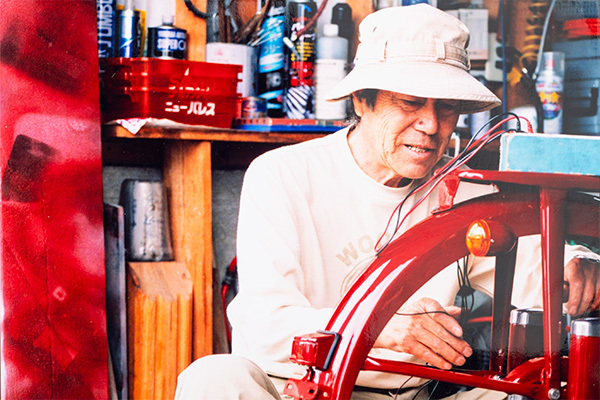 He restored dozens of vehicles over his lifetime, but he showed a special devotion in his work on Yamaha bikes and in particular the YA-1. He restored two YA-1 models. It seemed that he had particular emotional attachment to these because both times after he completed each one, he took it out of the garage and revved up the engine. He then took it for a short run to see how it went, and following that would just stand and admire it for a while. 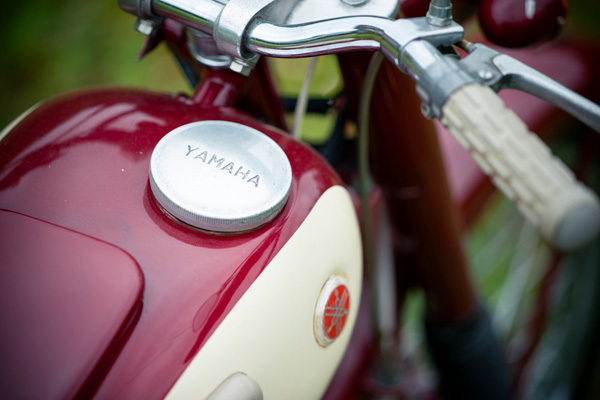 In addition to the YA-1 models he also restored other Yamaha bikes like the YC-1, DT-1. AT-1. YA-3, DS-5 and YDS-3. A major goal for him was to be able to exhibit his completed vehicles in the Concours d’Elegance contest, held annually in his hometown Furano. Due to his restoration skills being so high he won the grand prix prize several times. He always really looked forward to the meeting and to be amongst a large crowd of fellow like-minded motorcycle enthusiasts. Satoe recalled how he was a strict father and that his commitment to restoring the bikes was very strong, but he was always kind to her. When she was a student, Eiji gave her a scooter to get to school. 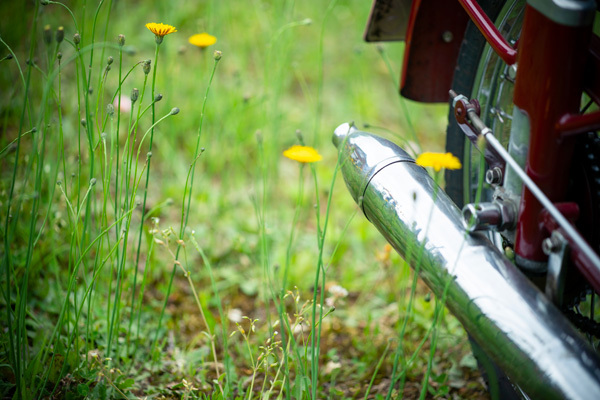 It was an off-road bike made from parts that his motorcycle companions had discarded. He took her to a nearby mountain to give the bike a test-run and for her to practice riding it. Satoe laughed as she told me that her first motorcycle experience was going up and down a mountain. 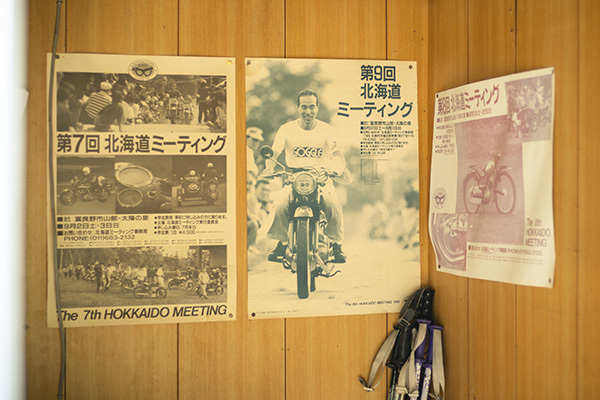 Around the time he started doing up motorcycles, Eiji developed rheumatism and so couldn’t move his limbs as much as he would have liked to, however he continued doing not only the restorations, but also his other hobby skiing for the rest of his days. Even when he could no longer write properly with a pencil and eventually even walk, he still persisted with the motorcycle maintenance, never giving up on his passion. 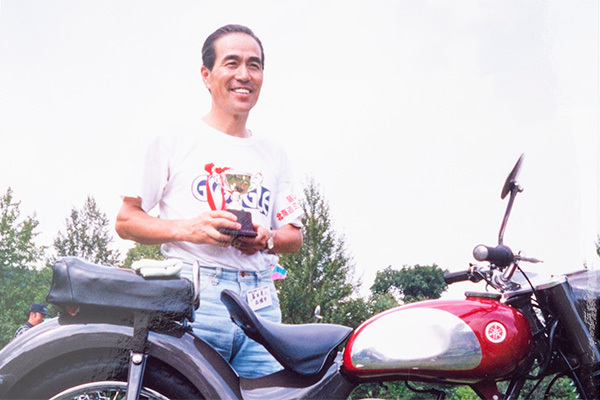 There were times that Satoe asked her father why he loved vintage motorcycles that much, and Eiji would respond: “The wind or something, when you are riding at a comfortable speed, or something like that”. He could never respond directly to the question or put it into a concrete reason, but he would always look happy when thinking about it. If you aren’t running, it’s not a bike. Eiji would often say things like this during his lifetime, coming from his deep understanding of restoring vintage bikes but also just the way he felt about them. In other words, essentially the appeal of motorcycles is that it is possible to move freely at a supernatural velocity with them. The YA-1 hadn’t been out of her father’s workshop for some time, and now its madder red color was gleaming in the sunlight. I suddenly saw an image of Satoe’s father as a young boy, excitedly chasing after it.